Anyone may get lentigines. Lentigo is a flat or slightly raised lesion that is darker than the surrounding skin. This is caused by an excess number of pigment cells and occurs most commonly on areas of sun-exposed skin, thus called solar lentigines. People over the age of 40, and especially with fair skin, are the largest population to get lentigines. They tend to be dark brown or black, round or oval and flat, often forming in small clusters on the backs of hands or on the face. 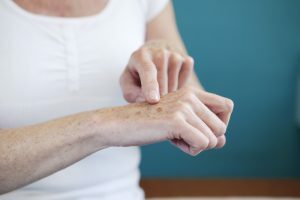 People commonly refer to solar lentigines as age spots or sun spots. Solar lentigines are best prevented by minimizing sun exposure. They are not typically cancerous, although a check by a dermatologist is recommended. There are various treatments we have available to decrease or remove lentigines.